Turkey is an amazing country to explore. 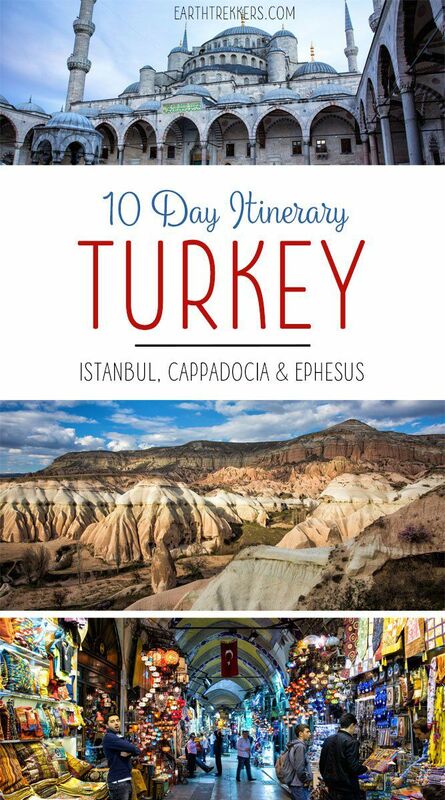 With 10 days, you can tour Istanbul, explore the fairytale land of Cappadocia, and visit the ancient Roman ruins of Ephesus. 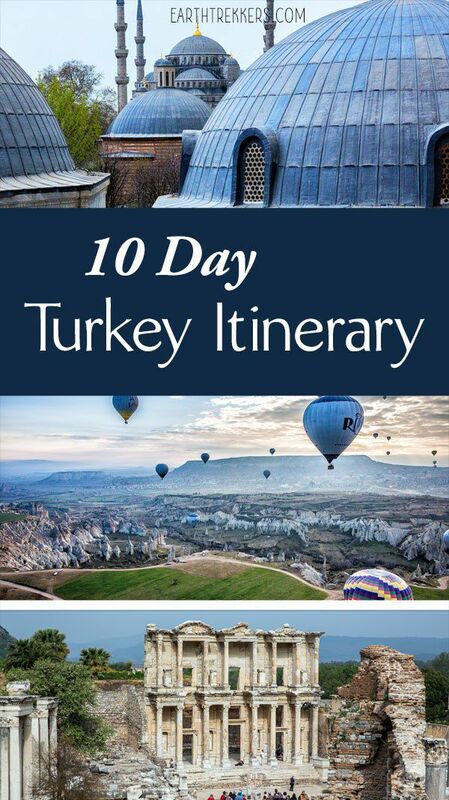 Highlights of this Turkey itinerary include a visit to the Hagia Sophia, shopping in the Grand Bazaar, hiking in Cappadocia, and a magical hot air balloon ride, if you so desire. A visit to Turkey is an extraordinary combination of history, dramatic landscapes, delicious food, and life changing experiences. Most international flights arrive in Istanbul. From Istanbul, take a short flight to Izmir. 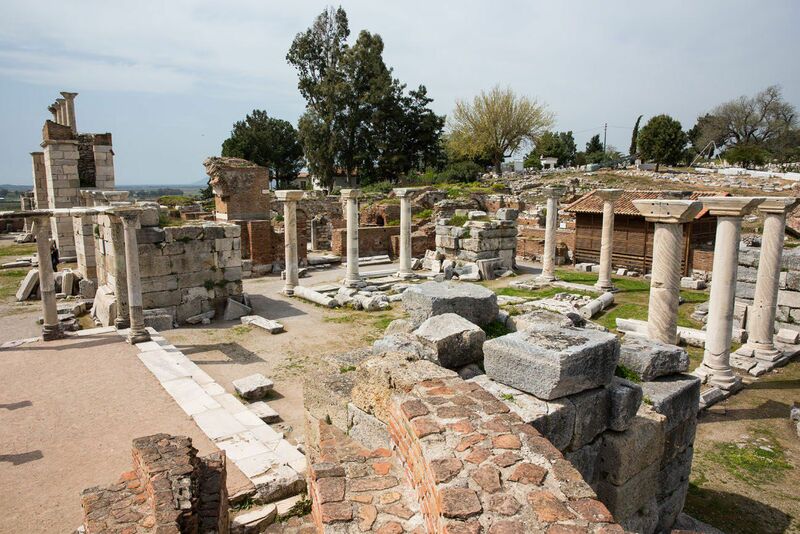 You will spend one night in this area, just enough time to visit the ancient ruins of Ephesus and the nearby sites. 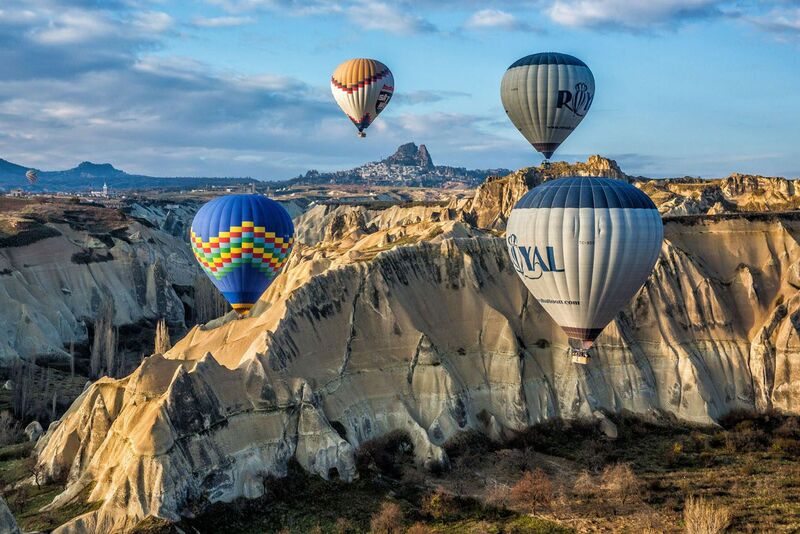 It’s a quick visit because we are saving time for the really good stuff, Istanbul and Cappadocia. I recommend renting a car at the Izmir airport. This is the easiest way to get around Izmir and Selcuk. If you have free time (and energy) in the afternoon, you can make the drive out to Cesme, a pretty city on the coast. Off in the distance you will be able to see the Greek island of Chios sitting in the Aegean Sea. Drive to Selcuk and get settled into your hotel. Where We Stayed: Saint John Hotel in Selcuk. This is a charming, small hotel just a short drive from Ephesus. I find it amazing how many historical sites are packed into such a small geographical area in Selcuk. 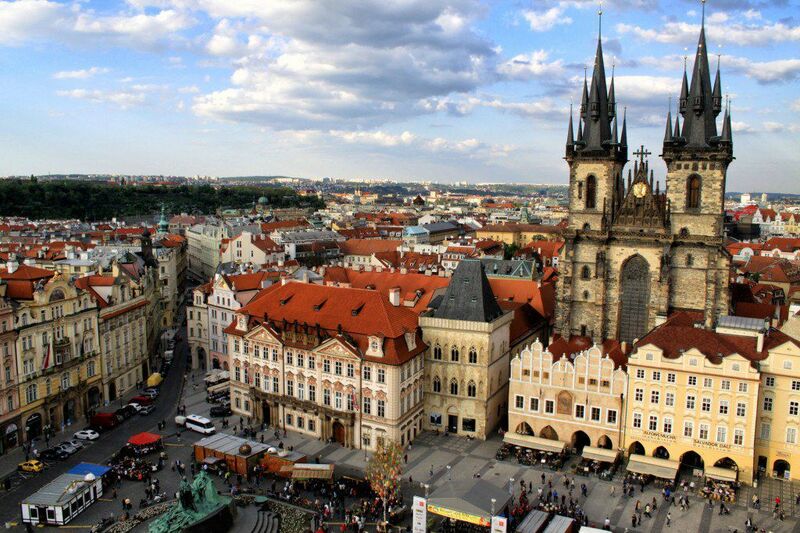 In this one small spot you can tour six historical sites and visit one charming small town. It’s a busy day, but since some of these visits are quick, you can visit all of these places in one day. The highlight of the day, without a doubt, is Ephesus. 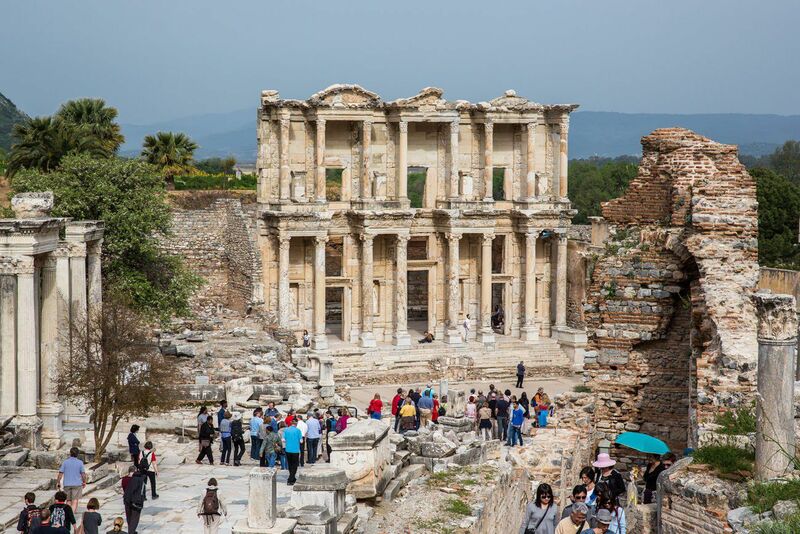 If you only visited Ephesus, it would be a great day. Ephesus (Efes in Turkish) was an ancient Greek city that later became a Roman city. 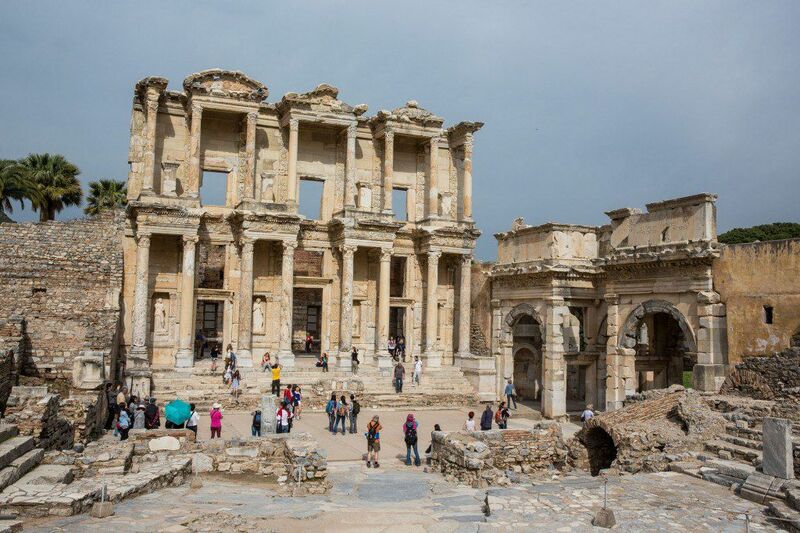 During the beginning of the Roman period, around 100 BC, Ephesus had a population of 250,000, making it one of the largest cities in the Mediterranean world. During your visit, walk down the Street of Curetes, see the iconic Library of Celsus, and take in the view from the top of the Great Theater. It’s worth a visit to the Terraced Houses, excavated “houses of the rich” that are decorated with frescoes and fine mosaics. Ephesus is a rather large archaeological site. A visit here can last anywhere from 2 hours to 5 hours. 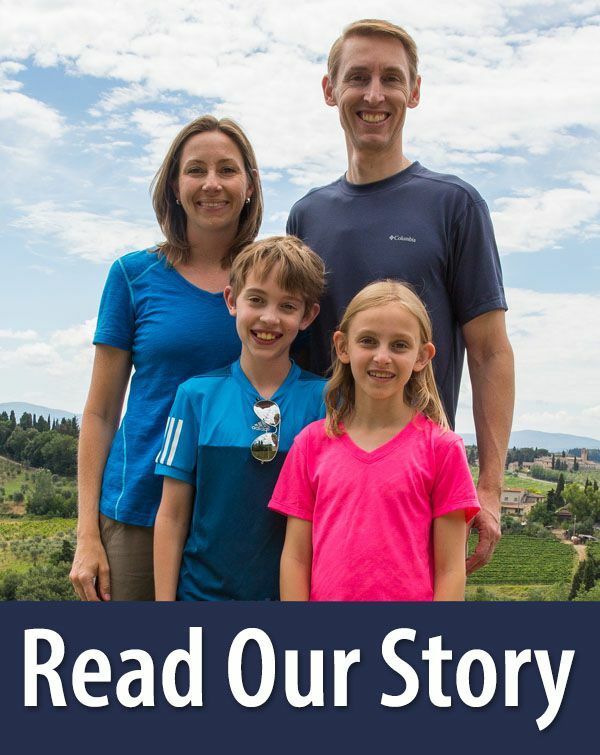 We followed Rick Steves’ walking tour. His tour, plus a visit to the Terraced Houses, took us about two hours. I recommend getting here at 8 am, opening time. 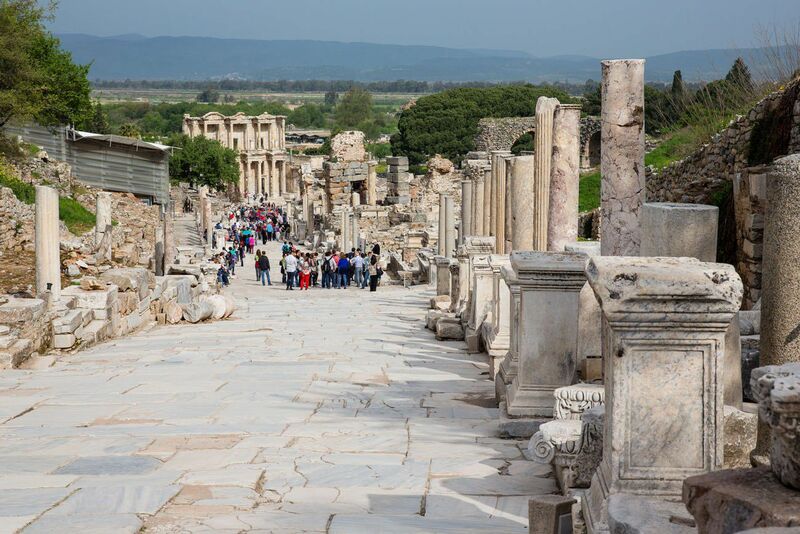 By getting here early you will miss the crowds (many people arrive midday, visiting Ephesus on a quick, whirlwind day trip from Istanbul) and you will still have plenty of time for the other sites around Selcuk. 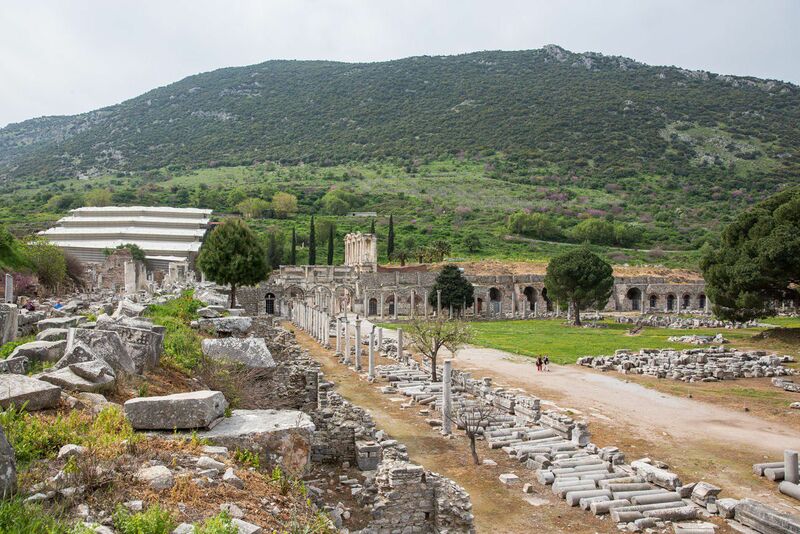 Just a short drive from Ephesus is the House of the Virgin Mary. This is the place where Mary may have spent her last days. She may have come here with Saint John, who spent several years in the area to spread Christianity. This is now a place of pilgrimage for Christians and has been visited by several Popes. This rather morbid looking site has a fascinating history. What looks like tombs are actually the beds from an ancient dormitory. In the third century AD, seven young men sought refuge in this cave from religious persecution, which they avoided by sleeping for centuries. According to legend, they were seen alive over 200 years later. The afternoon is spent visiting a few quick sites in Selcuk. Grab a quick bite to eat in town before moving on. 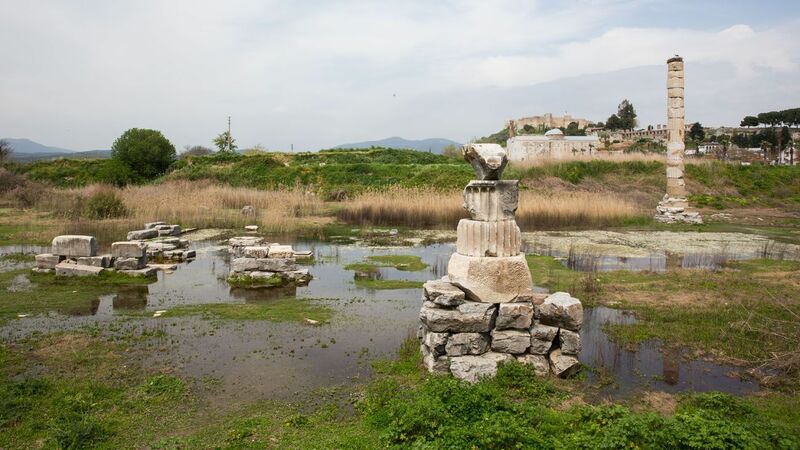 Your next stop is the Temple of Artemis, or better stated, what remains of the Temple of Artemis, which isn’t much. Behold one of the Ancient Wonders of the World. One pillar out of 127 remains standing in a boggy marsh. It was built around 323 BC as a shrine to the Goddess Artemis. A visit here is quick. Simply drive up, take in the view, and then continue on with your day. Located in the town of Selcuk, the Isa Bey Mosque is a mosque that was built between 1374 and 1375. Sitting next to Isa Bey Mosque is St. John’s Basilica. This was built in the 6th century AD at the believed burial site of John the Apostle. 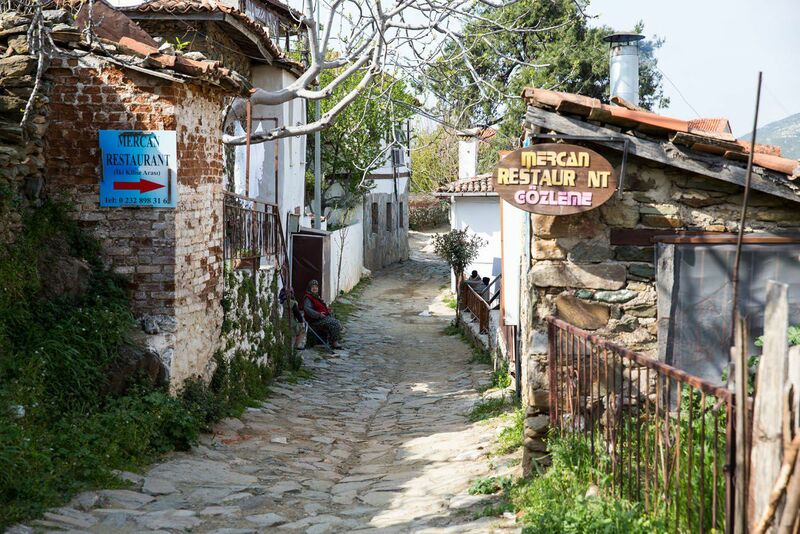 The mountains next to Selcuk are called the “Tuscany of Turkey.” Drive to Sirince and enjoy the views of the green mountains, wander the cobblestoned streets, and have an early dinner here. It may seem like a whirlwind of a day, and it is, but end the day with an evening flight from Izmir to Istanbul. 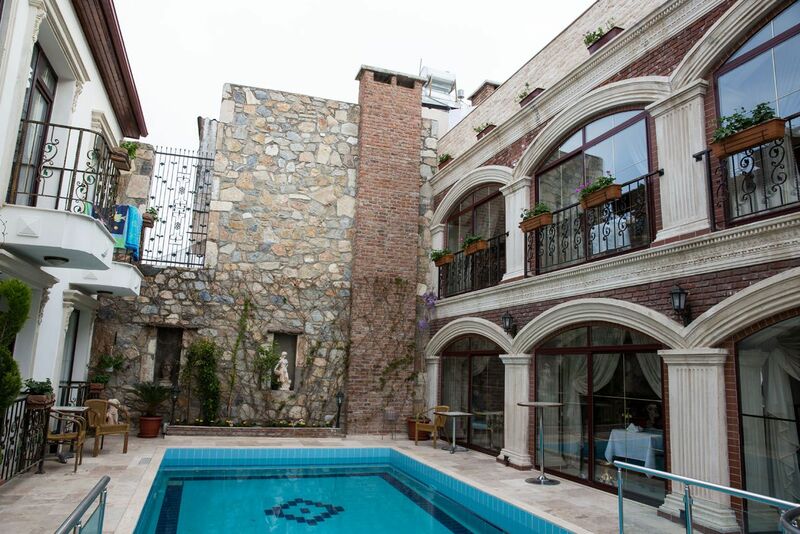 Where We Stayed in Istanbul: Hotel Uyan. 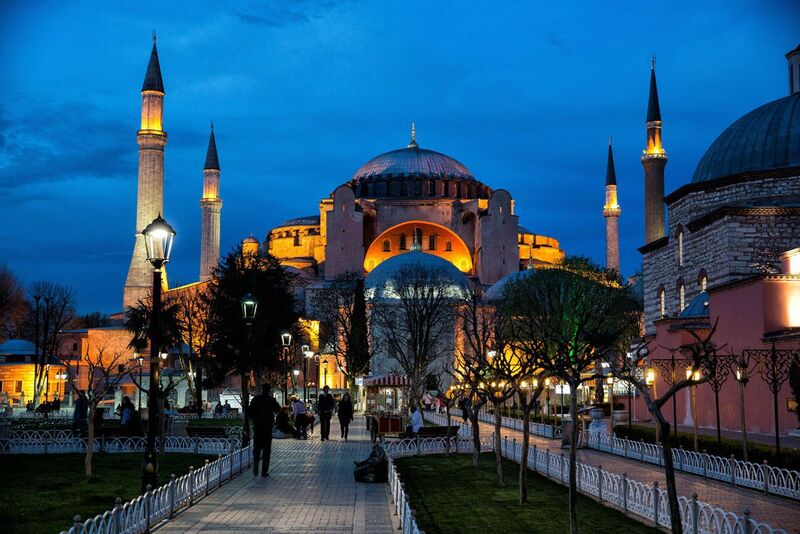 This small hotel is located within walking distance of the Hagia Sophia and the Blue Mosque. We stayed in the Blue Mosque Corner Room, a room that is relatively large for a European hotel. We had plenty of room for our family of four. From the windows we could see the Blue Mosque and the top of the Hagia Sophia. 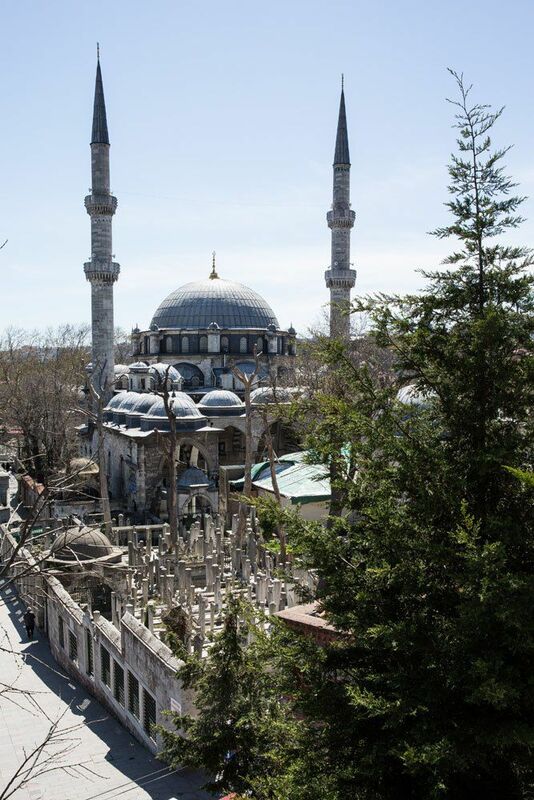 Every morning we awoke to the sound of the muezzin from the Blue Mosque. The hotel has an upper deck with awesome views over Istanbul. The view from the upper deck of Hotel Uyan. Start the day in Sultanahmet Square. Stand in the middle and slowly rotate 360 degrees. 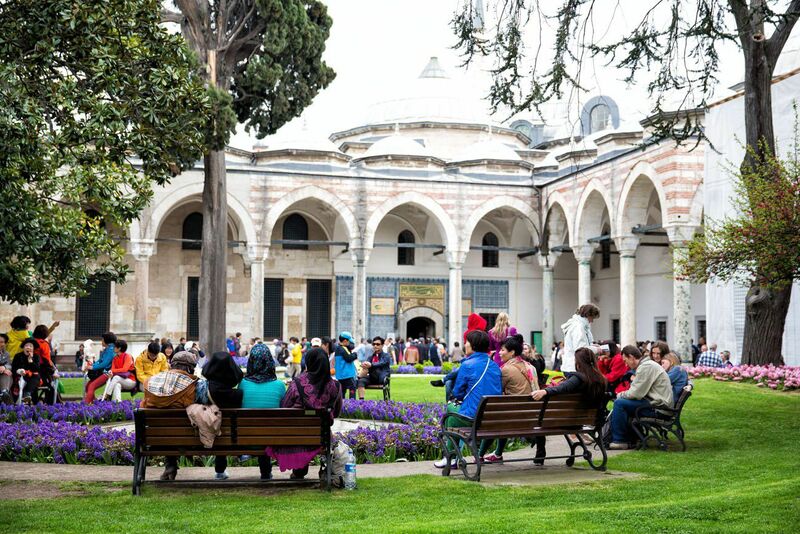 This beautiful square is home to both the Blue Mosque and the Hagia Sophia. It’s a gorgeous spot and the kind of place that can give you goose bumps. 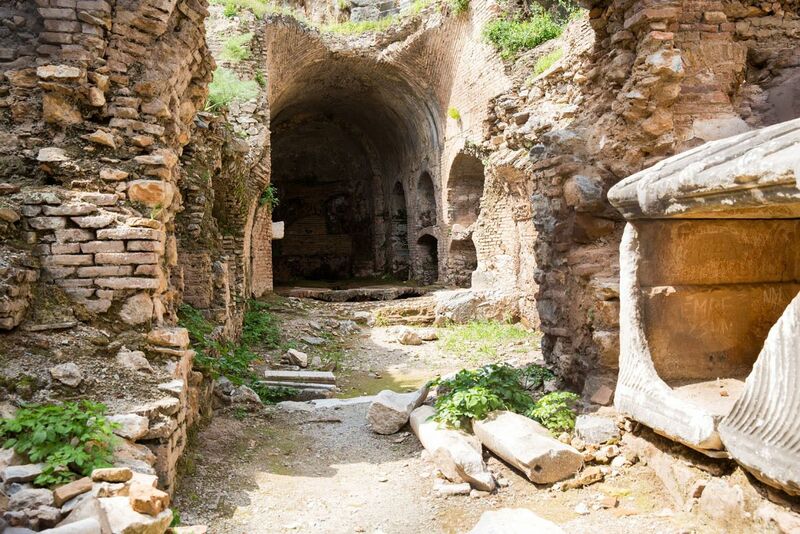 Just like in Selcuk, there is so much history here waiting to be explored. Start the day with a visit to the Blue Mosque. 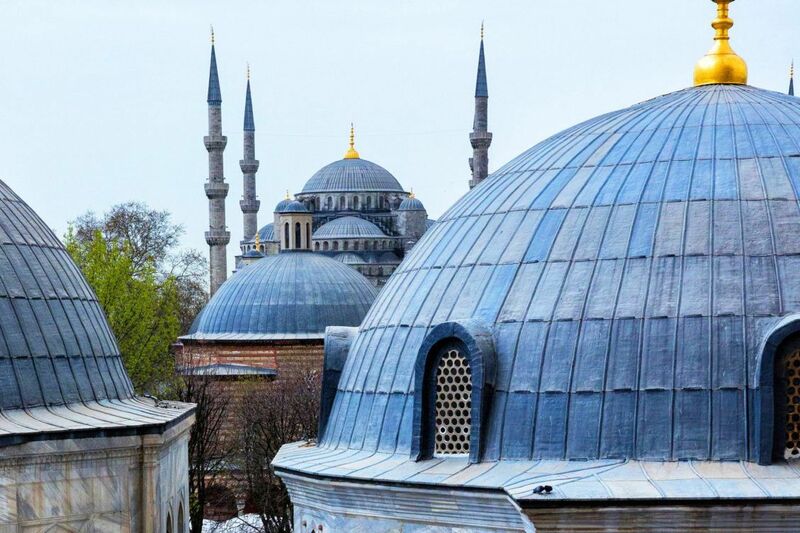 Built in 1616, the Blue Mosque is famous for the intricate blue tile work the covers the interior of the building. It is free to enter, and if you have never been inside of a mosque before, this is a good one to start with. Remove your shoes, if you are a woman you must cover your head, and quietly enter the mosque. Walk on the carpeted floors, stare up at the tiled ceilings and walls, and take in the grandeur of this place. Just a short walk from the Blue Mosque is the Hippodrome. Built in the 4th century AD, this was a venue for chariot races. 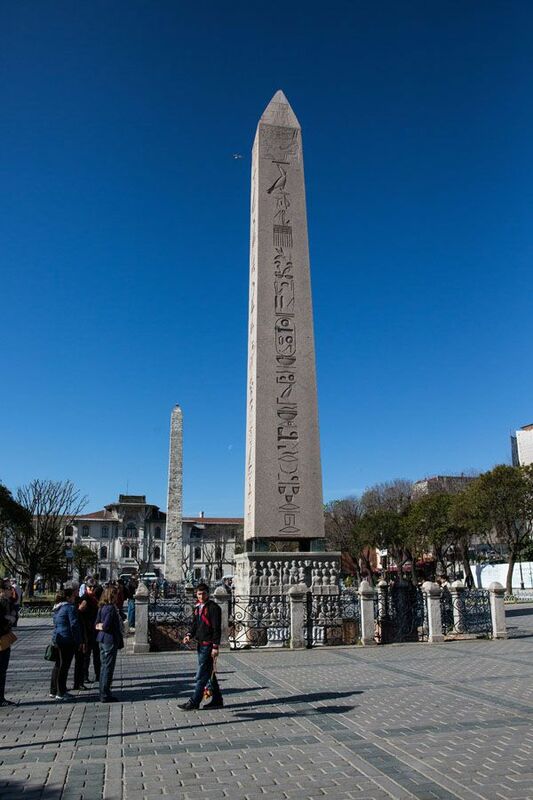 The centerpiece of the Hippodrome is the Egyptian obelisk. It was carved 3,500 years ago and brought to Istanbul in the 4th century AD. What you see here is only the top third of the original obelisk. 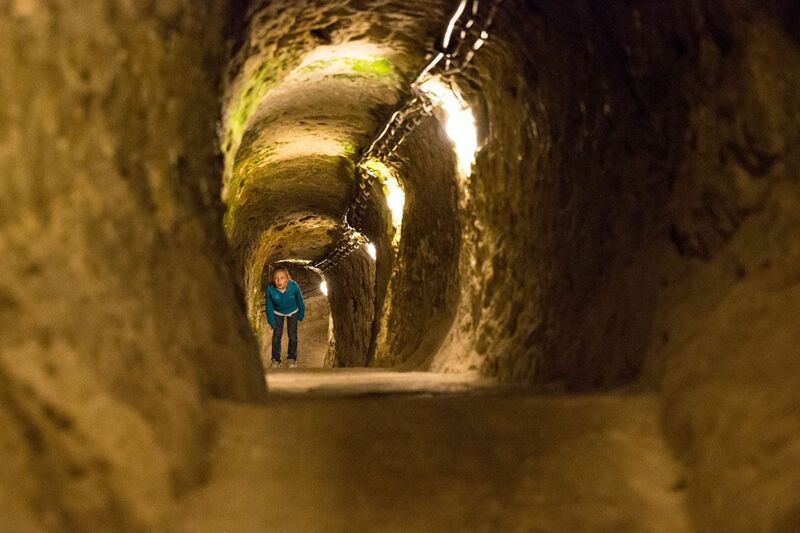 Descend underground to one of Istanbul’s ancient reservoirs. Here it is dark, chilly, and mysterious. 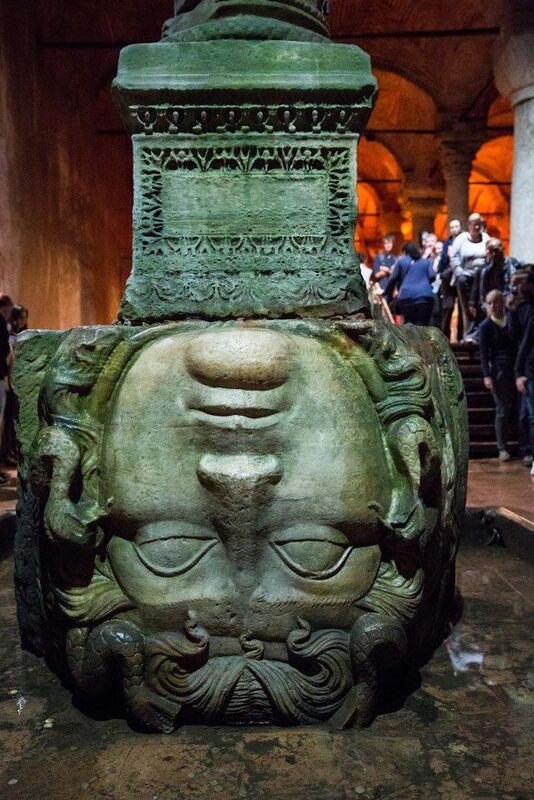 The highlight is seeing the two giant medusa heads. There are a lot of great lunch spots around the Basilica Cistern. Two we recommend for Turkish food are Fuego Restaurant and Beso Restaurant Bistro. Four thousand shops in the world’s oldest shopping mall…what fun! 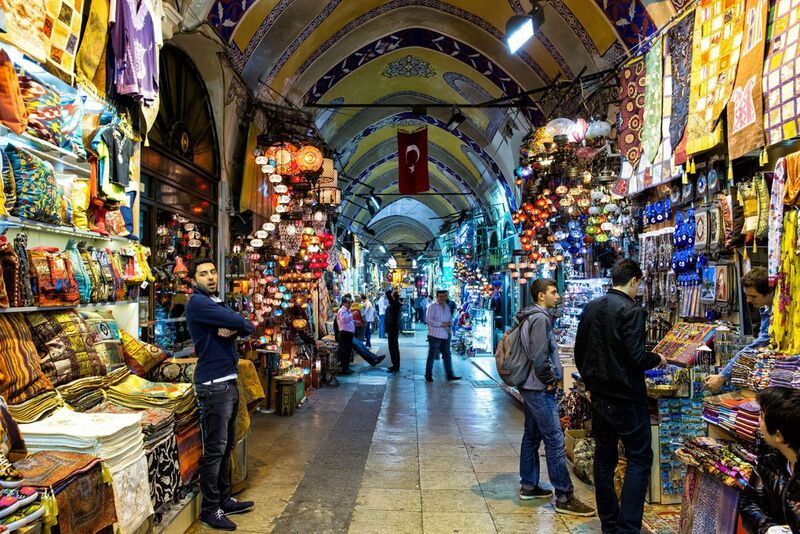 Spend the afternoon wandering through the Grand Bazaar. It can be overwhelming at first. It’s crowded, it’s colorful, and it’s very easy to lose your sense of direction. But that’s just all part of the experience. 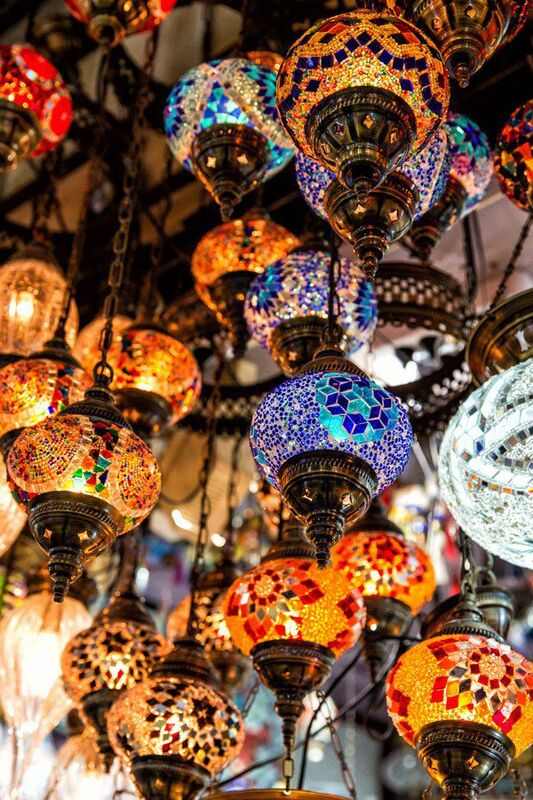 For sale are Turkish rugs, ceramic dishes, lanterns in a kaleidoscope of colors, clothing, and antiques. What starts off as being overwhelming and intimidating becomes more fun as you learn your way around and get better with bargaining. End the day with dinner and drinks. If you are looking for a highly rated restaurant with fabulous rooftop views over Istanbul, consider Olive Anatolian Restaurant. Our day starts at Sultanahmet Square once again. Today you get to visit the jaw-dropping Hagia Sophia. This cathedral was constructed in 537 AD. For 900 years it was the seat of the Orthodox Patriarch of Constantinople. The Hagia Sophia was the single greatest architectural achievement of the Byzantine Empire. 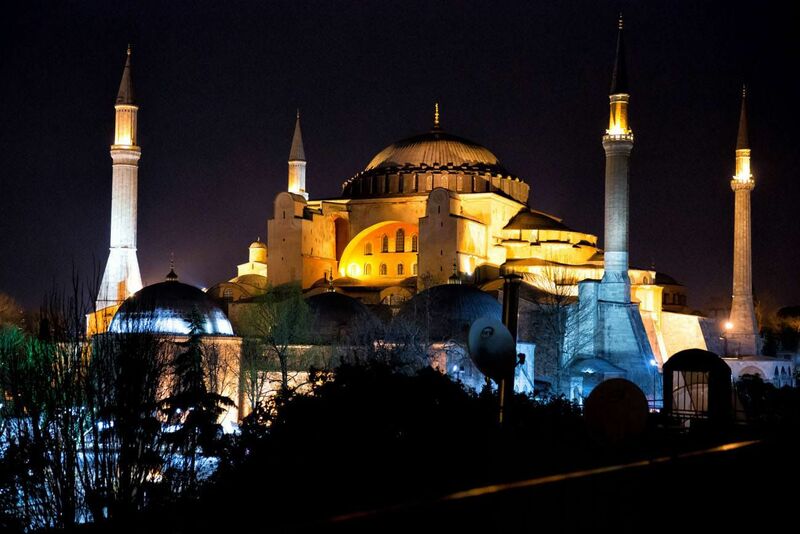 In 1453, when the Ottomans took over Constantinople, the Hagia Sophia was turned into a mosque. Now, it is a museum. Step inside this amazing wonder. 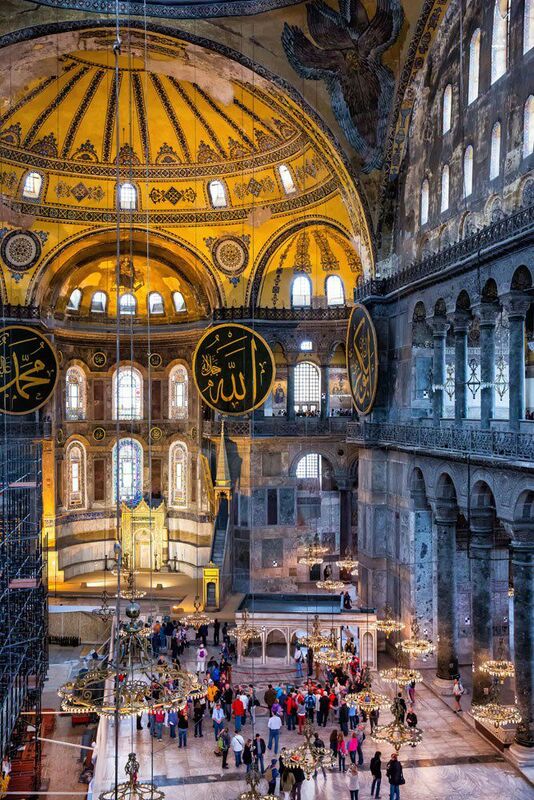 The Hagia Sophia still retains the elements of Christian and Islamic religions. Allow about two hours to tour the entire building. Pro Travel Tip: It’s best to get here at opening time. If you buy your tickets in advance or you have the Istanbul Museum Pass, you can skip the ticket office queue, but even so, lines to enter the Hagia Sophia can get long. If you do not buy your tickets in advance, I would recommend arriving at least 30 minutes before opening time to purchase your tickets. During our visit, the line began forming well before opening hours. Lunch spots near the Hagia Sophia and Topkapi Palace include Le Safran Restaurant and Gulhane Sark Sofrasi. Spend the afternoon touring Topkapi Palace. Topkapi Palace was the administrative center of the Ottoman Empire. This Palace was used for 400 years until Dolmabahce Palace was constructed in the mid 1800’s. One of the best places to visit in Topkapi Palace is the Harem, where the mother of the sultan, his wives, and his concubines lived. Topkapi Palace is a beautiful spot in Istanbul. Room after room is covered in exquisite tile work. If you are here in the springtime, the gardens are filled with tulips and hyacinths. Plus, the views of Istanbul from here are amazing. Cost: 60 TL + an additional 35 TL to visit the Harem. Included on the Museum Pass. Official website: For updated hours, pricing, and the full schedule of closing dates, click here. Have dinner near Topkapi Palace and the Hagia Sophia. Another restaurant with great reviews is the Old House Restaurant. I think it’s worth spending one evening in Sultanahmet Square at sunset. 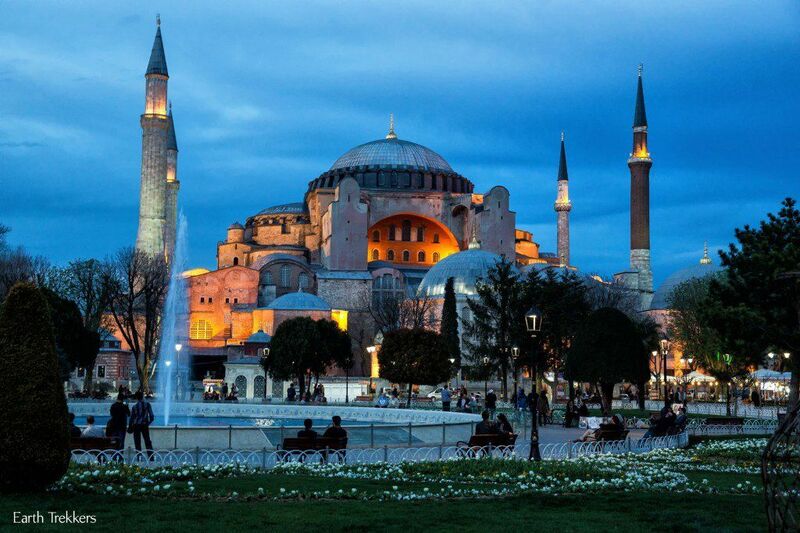 As the daylight fades, the Blue Mosque and the Hagia Sophia become illuminated. The Square becomes a gathering of people, a mix of locals and tourists. The muezzin plays one final time, a melody that is beautiful, comforting, and somewhat forlorn. Istanbul is the only city in the world to span two continents. Istanbul sits in Europe and Asia with the Bosphorus River dissecting it almost down the middle. 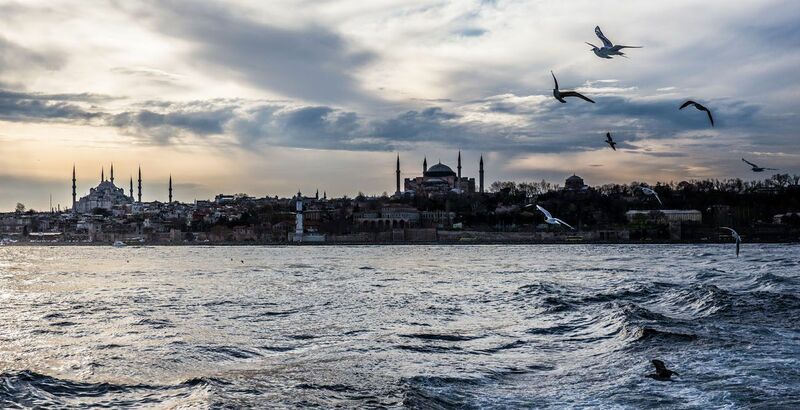 One of the must-have experiences in Istanbul is a cruise on this river. It’s also a great thing to do mid-trip. If you’re feeling a bit tired or low on energy, this is perfect timing. Take a break from the busy days of sightseeing and enjoy this relaxing, scenic boat trip up the Bosphorus River. This trip takes a full day, leaving at around 10 am and returning to Istanbul around 4 pm. On this cruise you sail up the Bosphorus River all of the way to the Black Sea. Midday, you have several hours to tour the fishing village of Anadolu Kavagi and visit Yoros Castle. If you have no desire to spend 6 hours on this cruise, you can book a short cruise, which lasts only 2 hours. You do not sail all of the way to the Black Sea or stop an Anadolu Kavagi. There are several companies offering cruises on the Bosphorus River. We used Sehir Hatlari and had a good experience. It’s a bit early for dinner, but if you’re hungry, consider dining at Hamdi Restaurant. This spot serves good Turkish food and baklava and it is famous for its views over the Golden Horn. 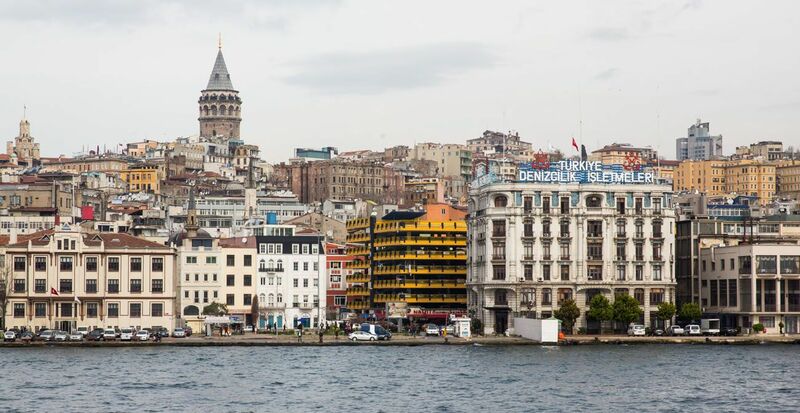 Take a stroll across the Galata Bridge. This is another spot we fell in love with during our visit to Istanbul. 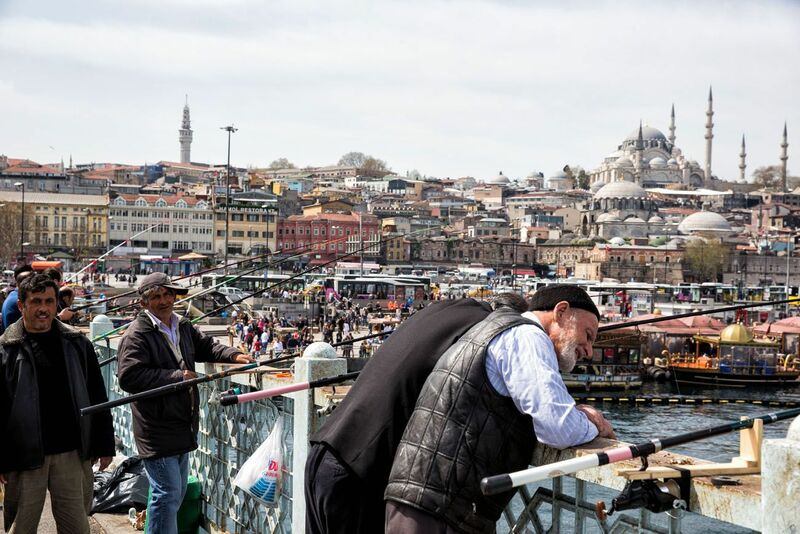 This is real Istanbul…the fisherman on the bridge, the views of the mosques and the Golden Horn, and the general liveliness of the area. There may be a line but it’s worth the wait. 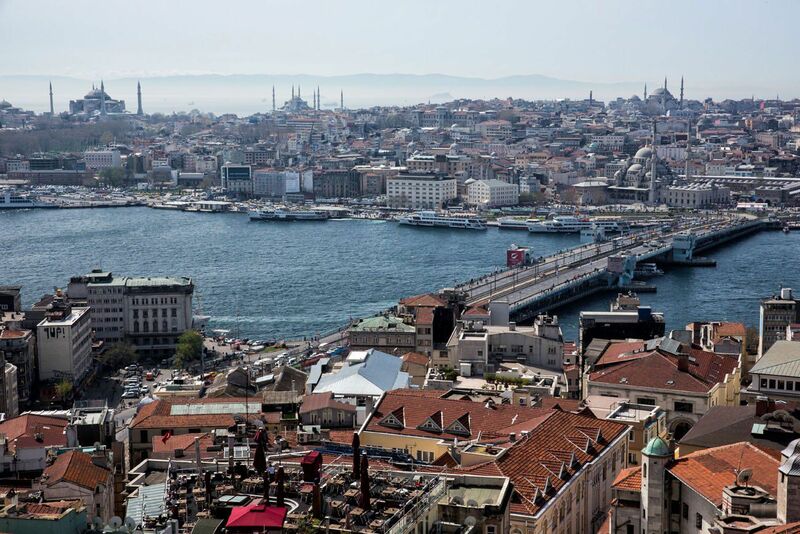 From the top of the Galata Tower you have one of the best views of Istanbul. If you can time your visit for sunset it can be magical. 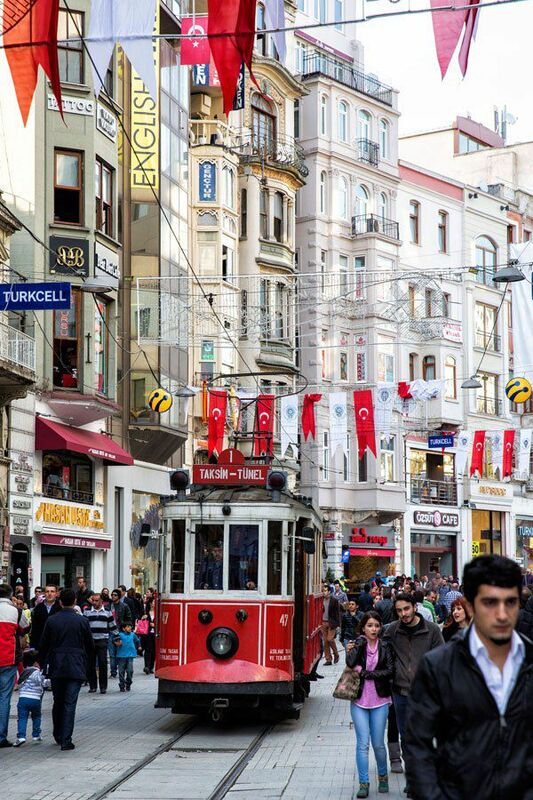 If you still have energy, consider a stroll up Istiklal Street, a famous street in the New District of Istanbul. It’s a popular shopping street and it can get quite crowded, but it’s worthwhile if you want to explore another part of Istanbul. However, if you are running low on energy, give this one a pass and end the day with the view from the Galata Tower. Eyup Sultan Mosque is located in a quieter, more conservative neighborhood in Istanbul. This mosque is a very sacred place for Muslims, joining the list of Mecca, Medina, and Jerusalem. 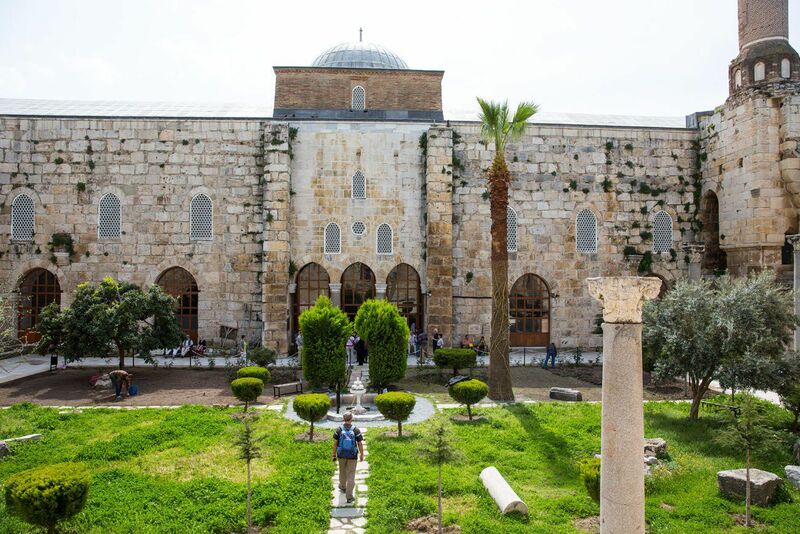 This mosque marks the burial site of Eyup al-Ansari, a close companion of Muhammad, who was killed in battle. You can visit the mosque and the mausoleum of Eyup al-Ansari. After your visit to the mosque, stroll uphill to the Pierre Loti Cafe. 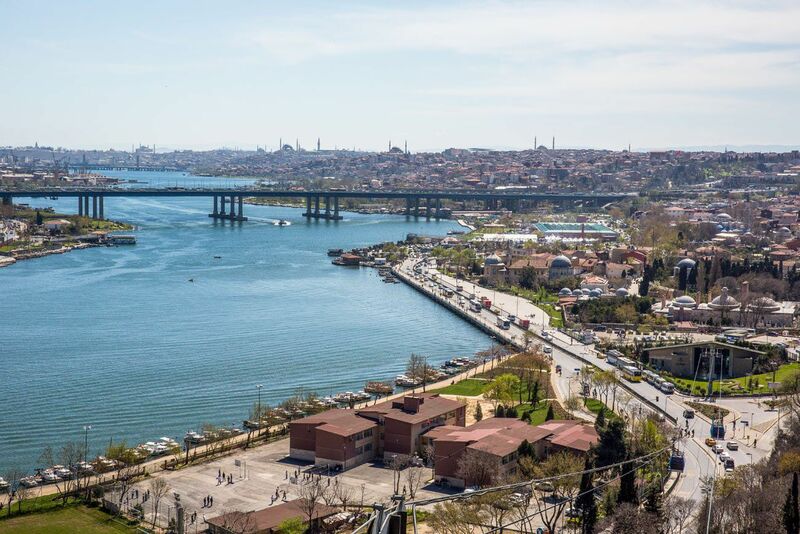 This walk takes you through a beautiful cemetery and from the hilltop you will have fabulous views over the Golden Horn of Istanbul. If you don’t feel like walking, there is a cable car (Eyup Teleferik) that can whisk you to the hilltop and save you some steps. From the Eyup Sultan Mosque, we took a taxi to the Chora Church. 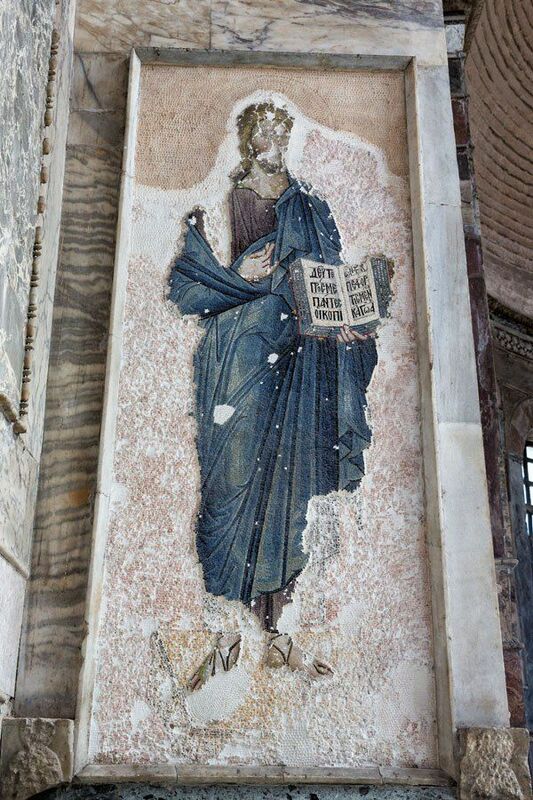 This church was built around 1100 AD and is famous for its mosaics and frescoes. These mosaics portray the life of Jesus Christ. We recommend dining at Asitane Restaurant. It’s an expensive restaurant but it gets rave reviews for its authentic Turkish cuisine. And it’s conveniently located next to the Chora Church. These giant walls were built in the 5th century. They stretch for 3.5 miles from the Sea of Maramara to the Golden Horn. 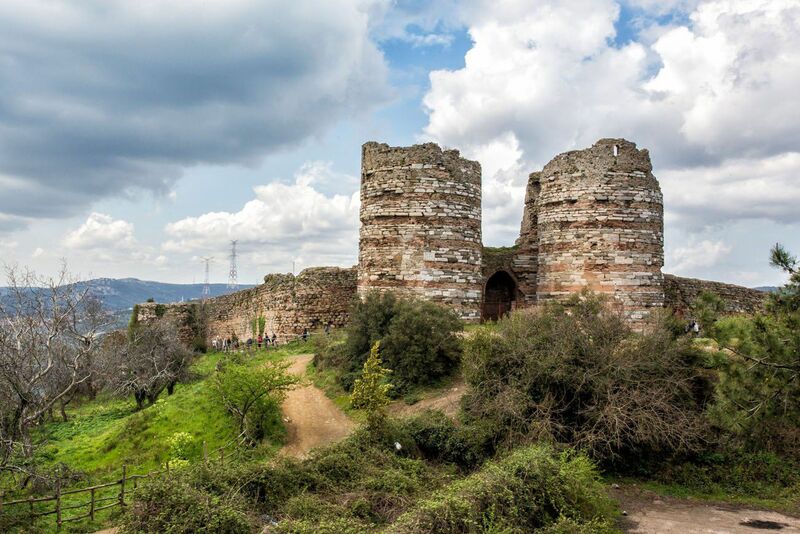 Designed to keep invaders out of Constantinople, these walls were only breached twice: first in the Fourth Crusade in 1204 and later by the Ottoman invasion in 1453. 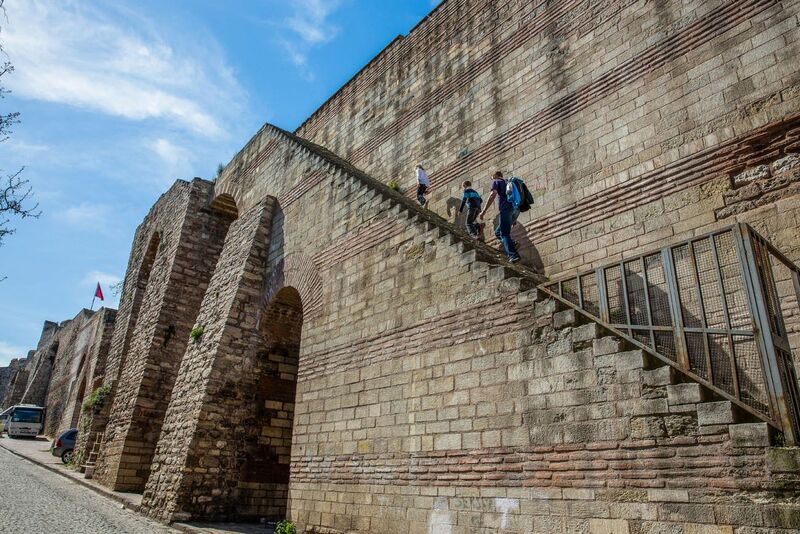 While in Istanbul, you can walk a portion of these walls. 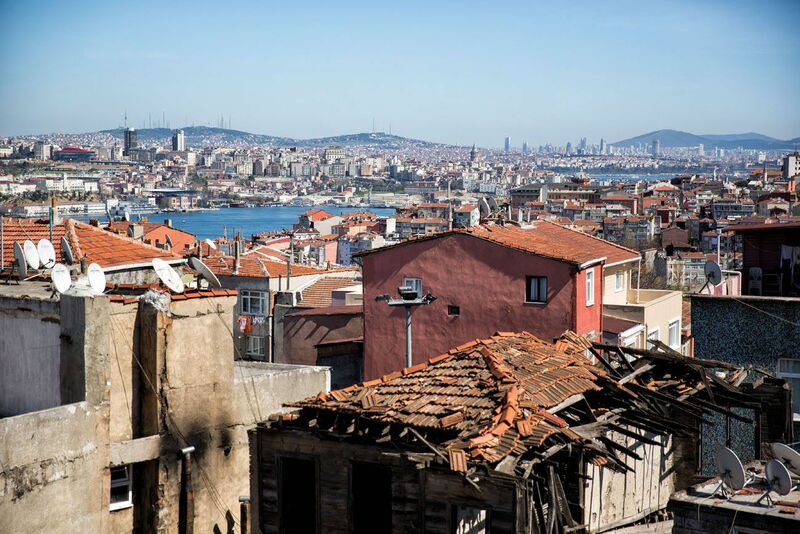 From here, you are overlooking the neighborhoods of Fener and Balat, getting a unique perspective of the city. 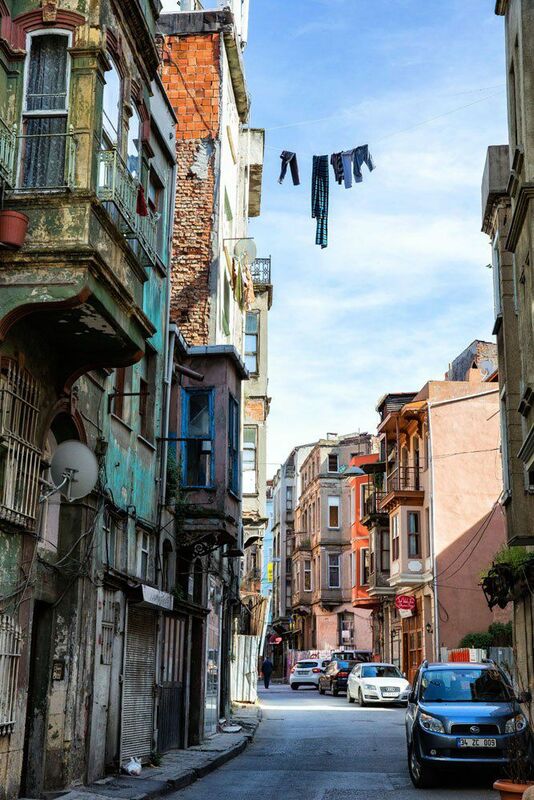 After walking the walls you have the option to stroll through the neighborhoods of Fener and Balat. We followed Rick Steves’ City Walls and Neighborhoods Walk in his Istanbul guidebook. It took us about 2.5 hours, starting at the Chora Church and ending at the Greek Orthodox Patriarchate. From the Greek Orthodox Patriarchate we took a taxi to our next destination. In this case, next up is the amazing Mosque of Suleyman the Magnificent. 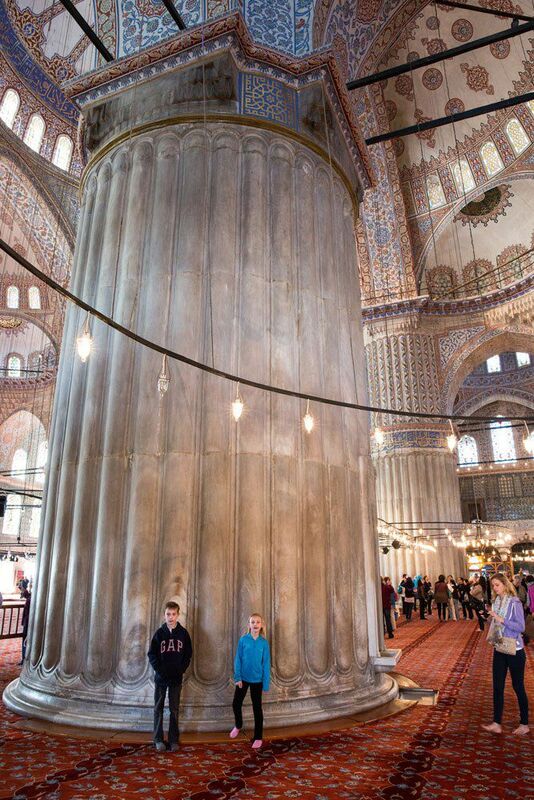 This mosque gets our vote for the most beautiful mosque in Istanbul. It was renovated in 2010, which accounts for its sparkling interior. This mosque is actually older than the Blue Mosque, but only by 60 years. It was built by the sultan Suleyman the Magnificent during the Golden Age of the Ottoman Empire. For the best, cheap experience in Istanbul, take the commuter ferry from Eminonu across the Bosphorus River to Kadikoy. This round trip excursion takes about an hour and when we did it, it cost just $1 per person. 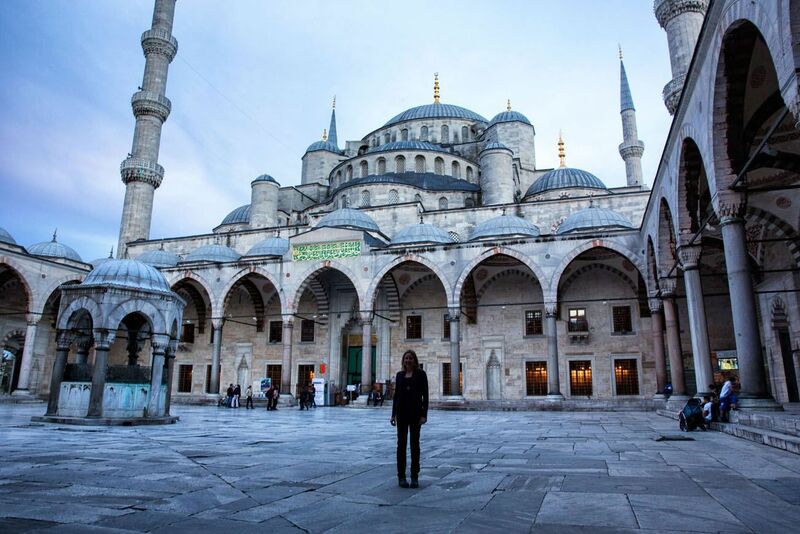 Mix in with the locals and enjoy the views back to the Blue Mosque and the Hagia Sophia. If you are traveling with kids, bring some bread to feed the seagulls that follow the ferry. This is a great activity to do at sunset because the views back to the Sultanahmet District are amazing. 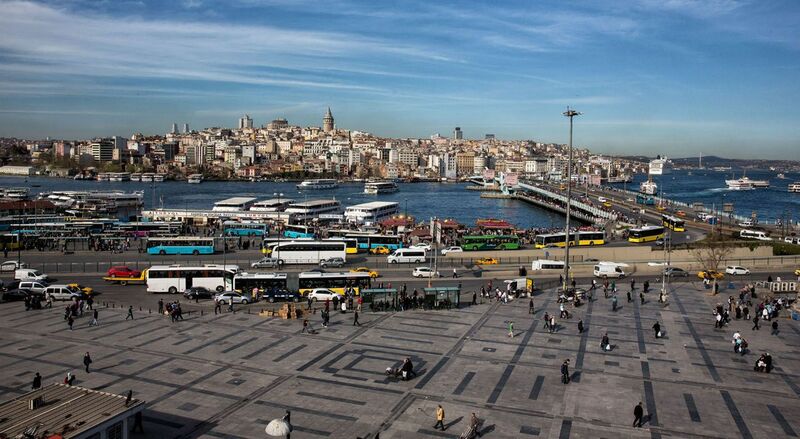 You can catch the ferry right from Eminonu Square near the Galata Bridge. 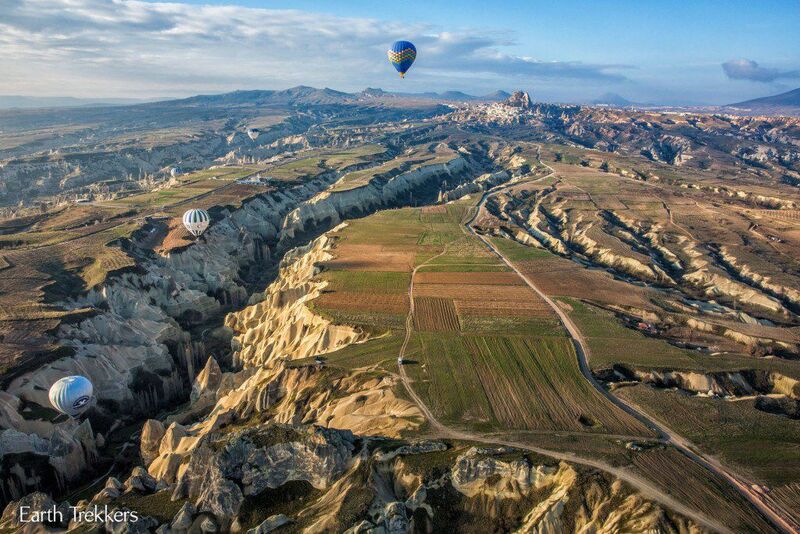 Catch an early morning flight to Cappadocia. Airports are located in Kayseri and Nevsehir and airport shuttles will connect you from the airport to your hotel. 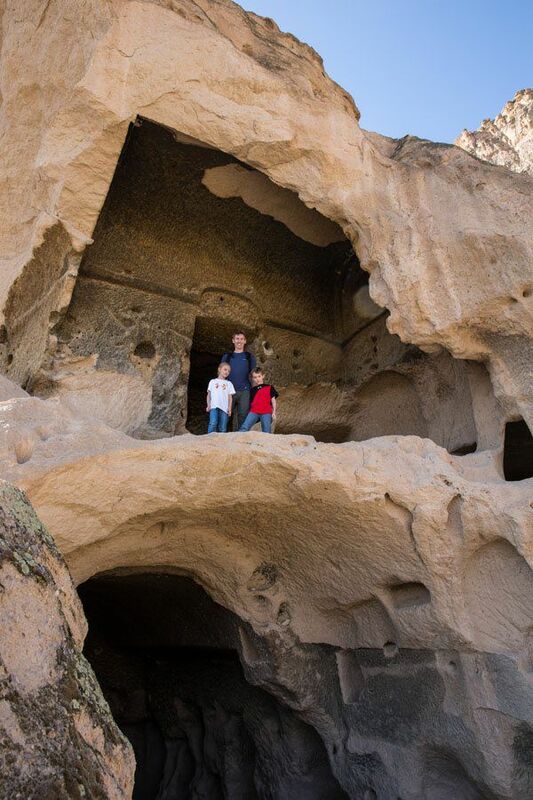 Check into your hotel and spend the rest of the day touring Cappadocia. You can rent a car or hire a driver. We hired a driver because we did several point-to-point hikes and did not want to have to work out the difficult logistics of getting back to our car. 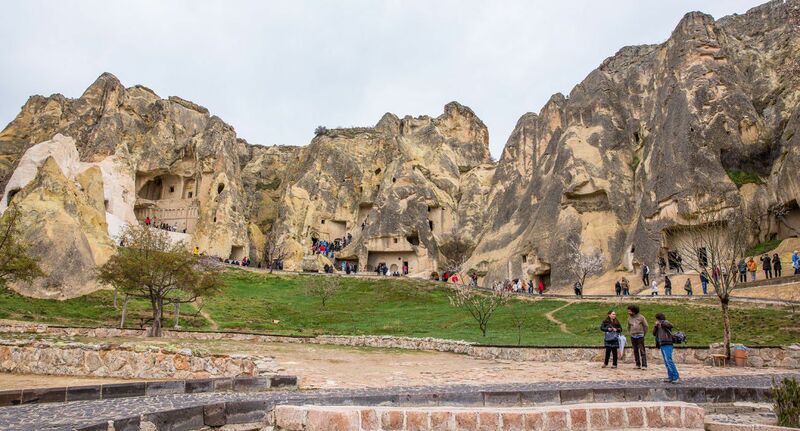 Today, visit Uchisar, the highest point in Cappadocia, the Goreme Open Air Museum, Monks Valley, Devrent Valley, and go on the short, memorable hike through Love Valley. 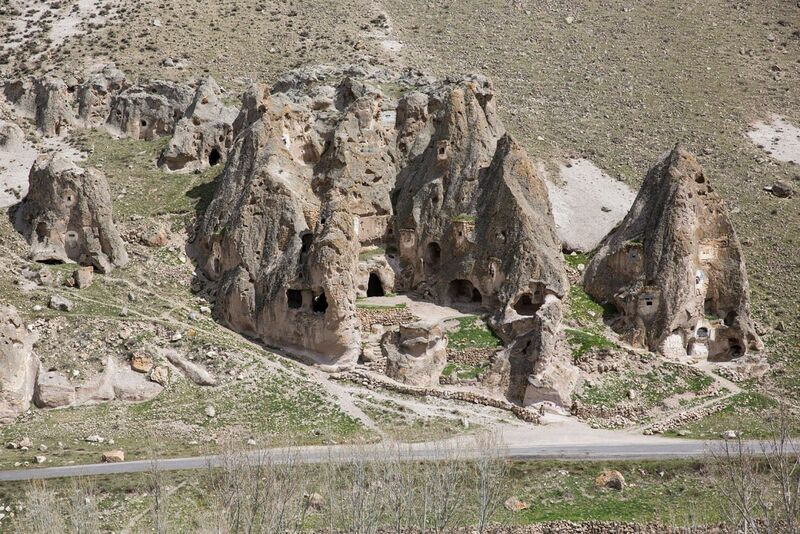 Where We Stayed: I highly recommend staying in a cave hotel in Cappadocia. It’s a very unique experience and still remains one of our favorite hotel accommodations, ever. 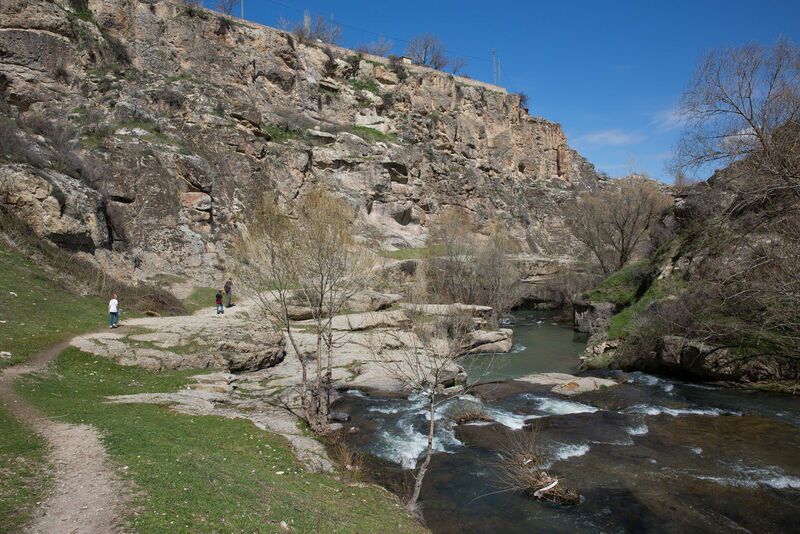 We stayed at Yunak Evleri Hotel in Urgup and had a perfect experience. The staff was friendly, attentive, and met all of our needs. Our room was quiet and comfortable and had plenty of room for our family of four. 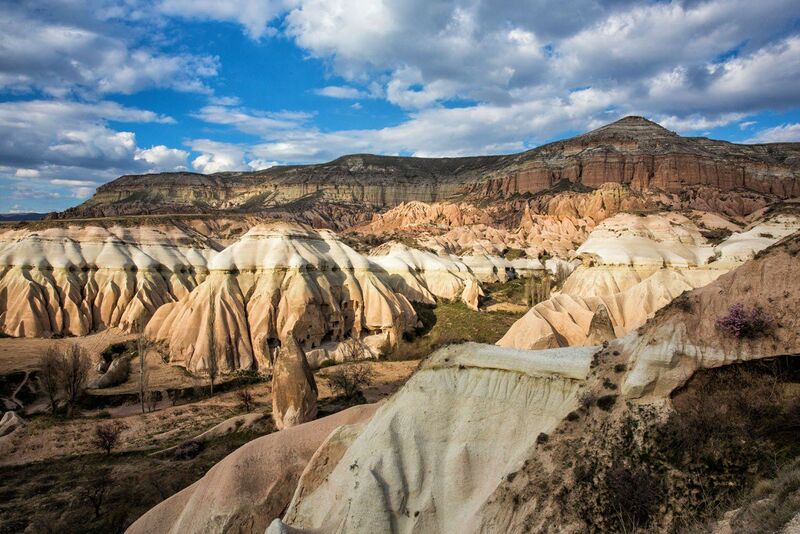 I would stay here again on a future visit to Cappadocia. Located a half hour south of Urgup, this valley is filled with churches carved into the mountains. 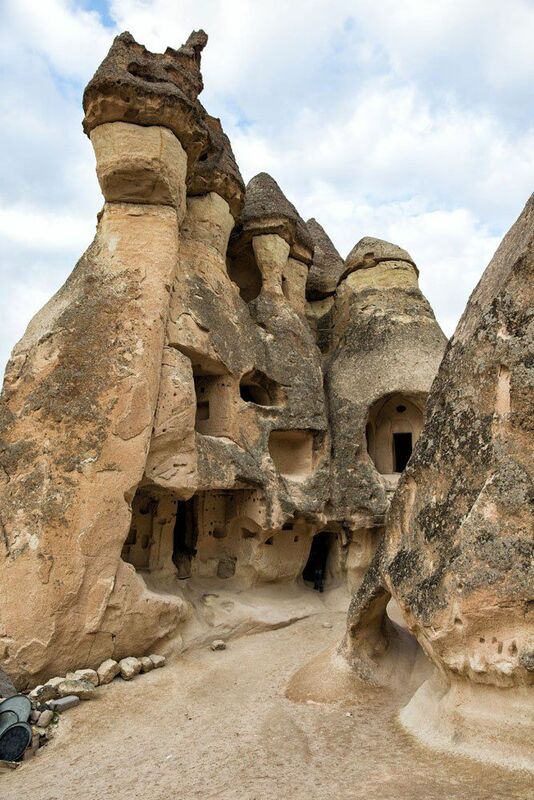 It’s similar to the Goreme Open Air Museum, but this area typically gets fewer visitors so it can be a nicer experience. Spend the afternoon hiking the Rose and Red Valleys. This is another short, easy hike and the views are amazing. Sunset Point, overlooking the Rose and Red Valleys, is the most popular spot to watch the sunset in Cappadocia. Enjoy the view and then end the day with dinner in town. 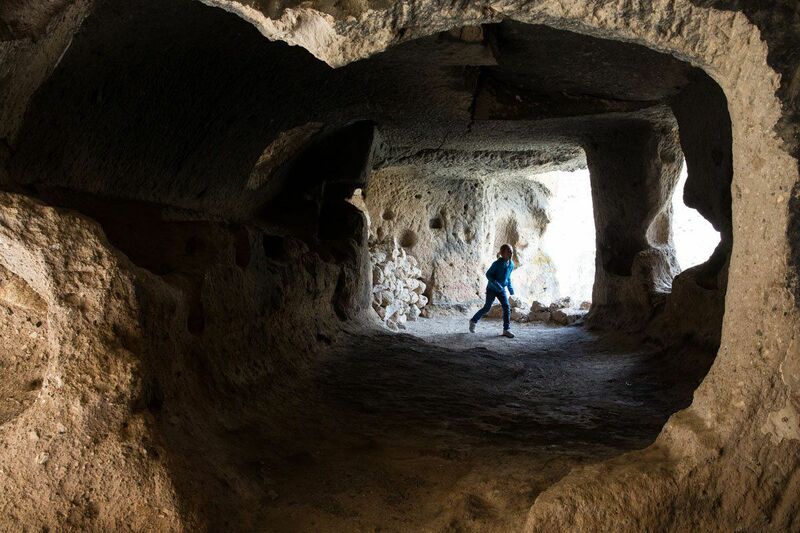 Derinkuyu is the largest of the underground cities in Cappadocia. Believed to have been built in the 7th and 8th centuries B.C., this city could accommodate 20,000 people on its 16 levels. Derinkuyu was inhabited until the early 20th century but is now on display as a museum. It takes about an hour and a half to tour Derinkuyu. 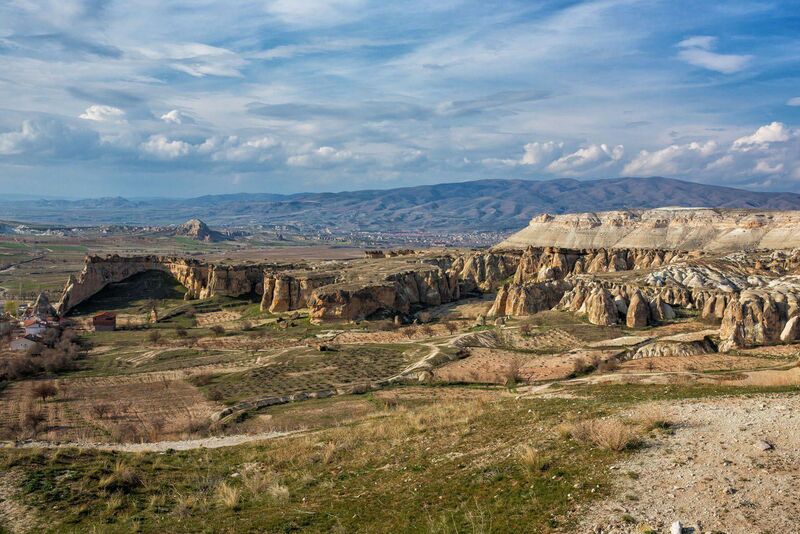 About an hour away from Cappadocia is the Ihlara Valley. This hike is a 4-mile point-to-point hike through the Ihlara Valley. It is a flat, easy hike that can be done quickly, as there are few climbs or obstacles. The follows along a river, with chances to explore more caves along the way. While in the area, visit the Selime Cathedral, the largest church in Cappadocia. From Selime Cathedral, the highway that takes you back to Urgup is the same path as the Silk Road took hundreds of years ago. Located on the side of the road is a caravanserai, a large stone building that was an overnight stopping point for people transporting their goods along the Silk Road. End the day with dinner at your hotel or in town. Today you will begin your journey home. 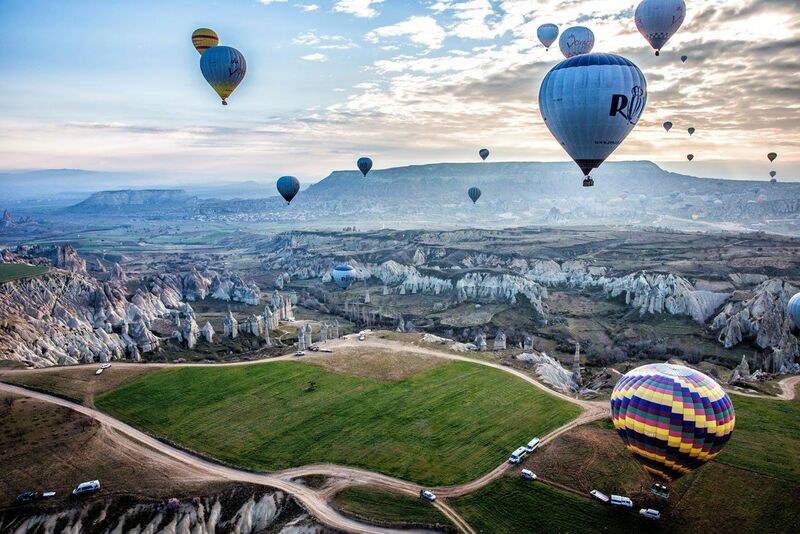 Most likely, you will fly from Cappadocia to Istanbul to your hometown. Or, for those with more time, continue your journey. Visit the terraces of the calcium-rich thermal springs in Pamukkale. Go paragliding from Babadag in Oludeniz. Visit the historical sites and beaches in Antalya. Spring (April, May, and June) and autumn (mid-September through mid-November) are the best times to visit Turkey. The days are warm and the nights are cool with little rainfall. The spring months are peak season for tourists, so expect higher prices and large crowds. Summer is hot and dry and can also be crowded when people take their summer holidays. The winter months can be cold and wet. We visited Turkey at the end of March into early April during Easter Break. We had a mix of cool, cloudy days with a touch of rain, and warm, sunny days. Even though we visited during Easter, most places seemed surprisingly empty. Turkey is a Muslim country. Women should keep their knees and shoulders covered. 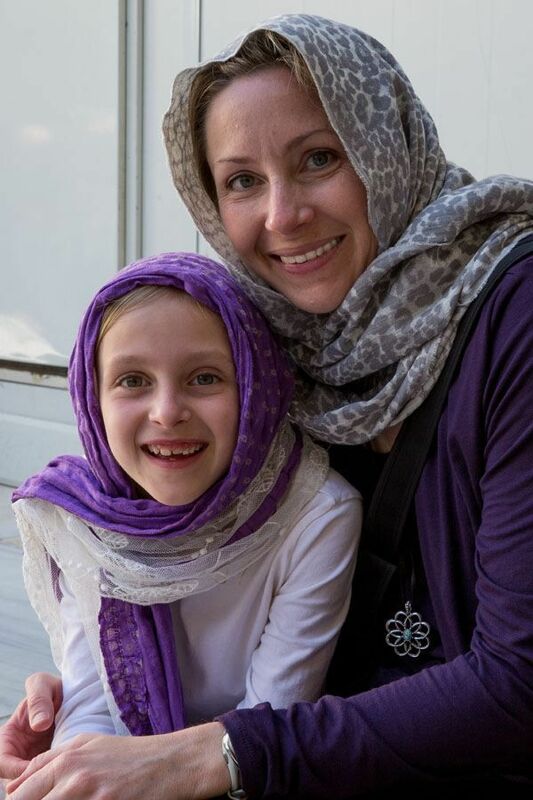 I recommend bringing a scarf to wear as a head covering when you visit the mosques. Most places will provide one for you but I prefer having my own. Is the Museum Pass Worth It? The Museum Pass is a card that covers your admission to several of the main museums in Istanbul. It is valid for 5 days and with this card you can skip the ticket lines. It costs 185 TL. 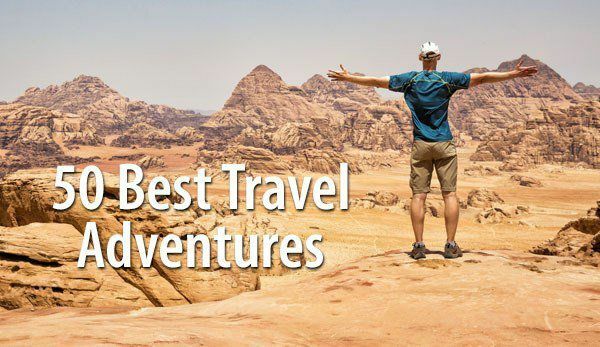 If you follow this itinerary, you will visit three of the museums that are covered (Hagia Sophia, Chora Church, Topkapi Palace and the Harem) for a grand total of 170 TL. If you follow this itinerary, the Museum Pass does not offer any savings (although it does allow you to bypass the ticket lines, which may be worth the extra amount you will spend for the Museum Pass). Click here to learn more about the Museum Pass. 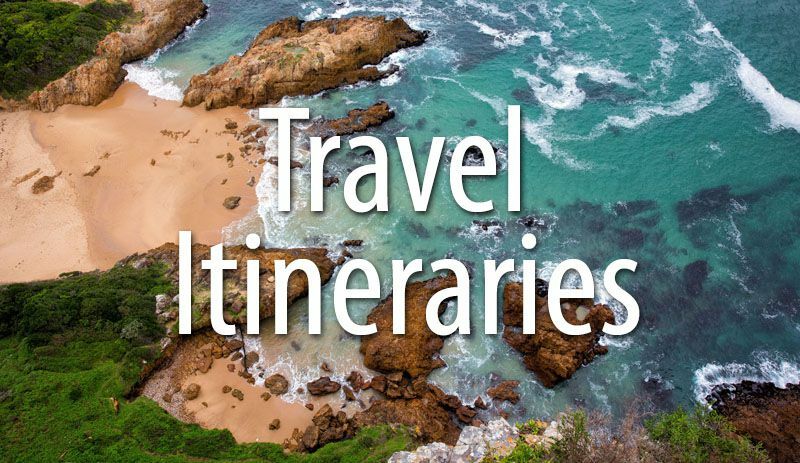 If you have any questions about this itinerary, comment below. Are the Turkish people friendly with Americans? 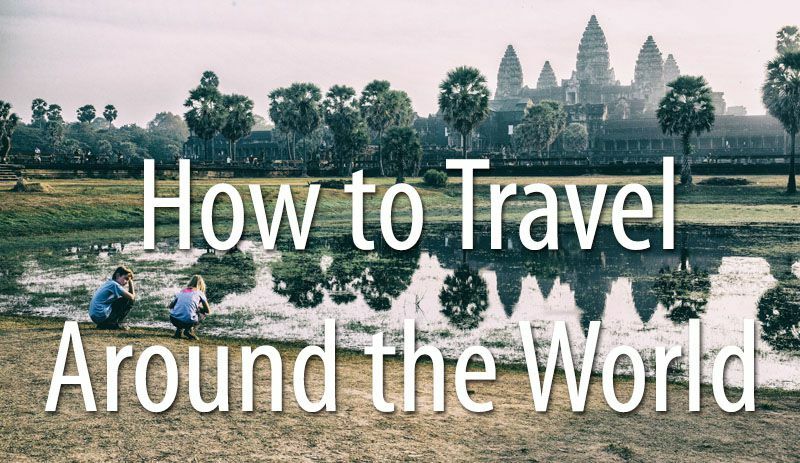 Anything’s to avoid when traveling in the cities? Many thanks for the insightful information 🙂 My buddy and I are looking into 4-5 nights budget trip to Istanbul from London during the Easter period. We plan to go on budget with accommodation, food, and transportation. 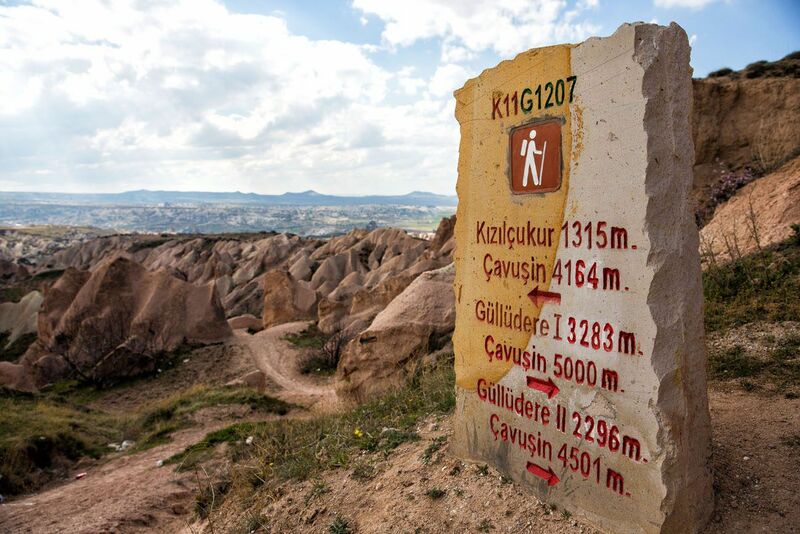 And we plan to do Cappadocia. 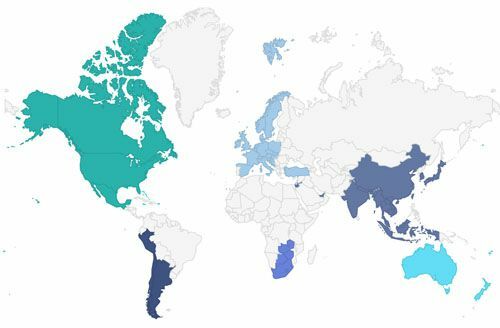 Any idea what is the best way for us to travel? Thanks. First, I am loving your website, thank you for all the valuable information! 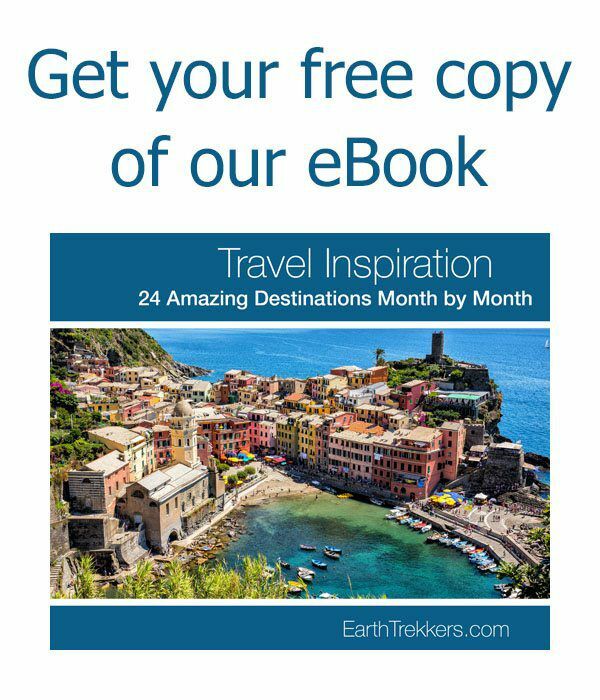 I was thinking to take this exact trip end of April, beginning of May so i was wondering for overall trip expenses per person, how much money shall i expect to save ? This was really helpful! 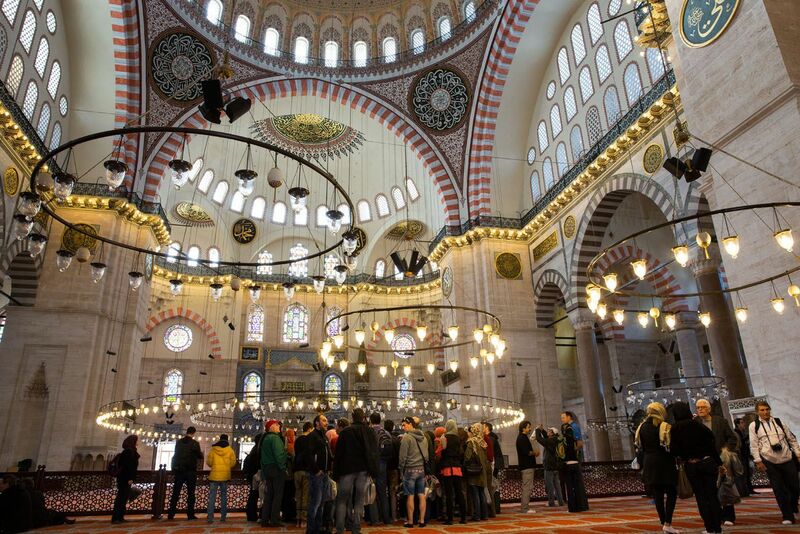 Not many blogs have extensive information regarding Turkey- just a night or two in Istanbul. 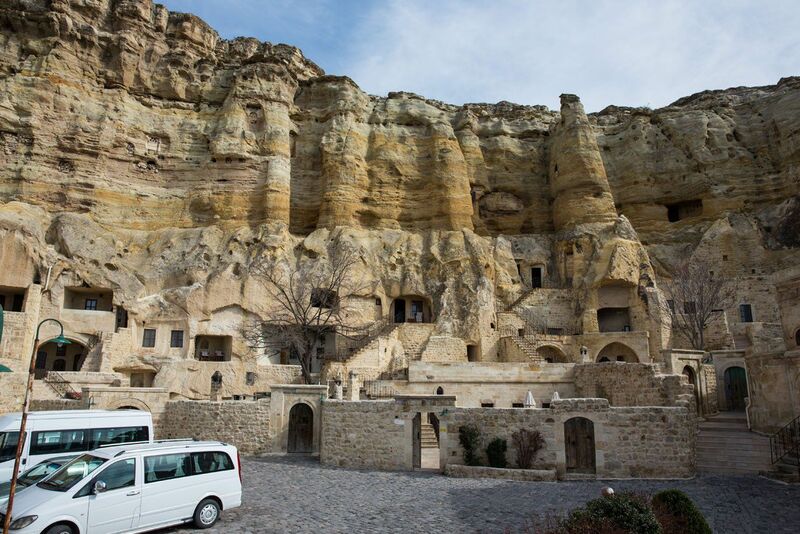 I’m really hoping to spend a week throughout Turkey in early May… do you remember approximately how much a driver cost for the day in Cappadocia? 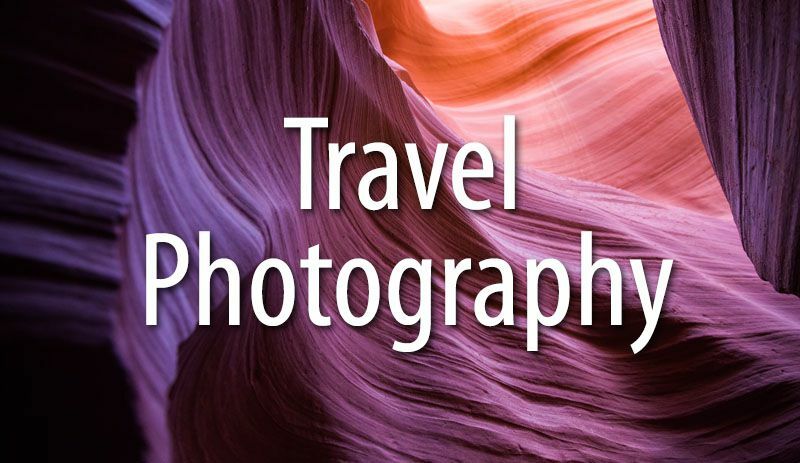 Just wondering, on average, how much would you say your trip cost? Cheers! Very informative post, a lot of information and practical tips. I’ve enjoyed reading it and in the same time planning in my head my own trip ? Thank you so much ?